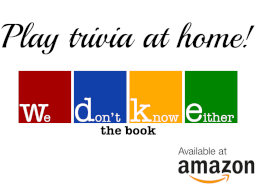 It's been a long time coming, but is finally here: the District Trivia you love in book format. Announcing We Don't Know Either: Trivia Night Done Right! Available today at Amazon, Barnes & Noble, Target, and a book store near you! "After reading this book I realized that it is time to retire. There's nothing else to learn that's not in this book. Everyone who reads this will now be as smart as me." "Reading this book taught me that I am older than sliced bread. I don't like it." "They want me to give them a quote about what? I'm not doing that." "I now know what facts are."